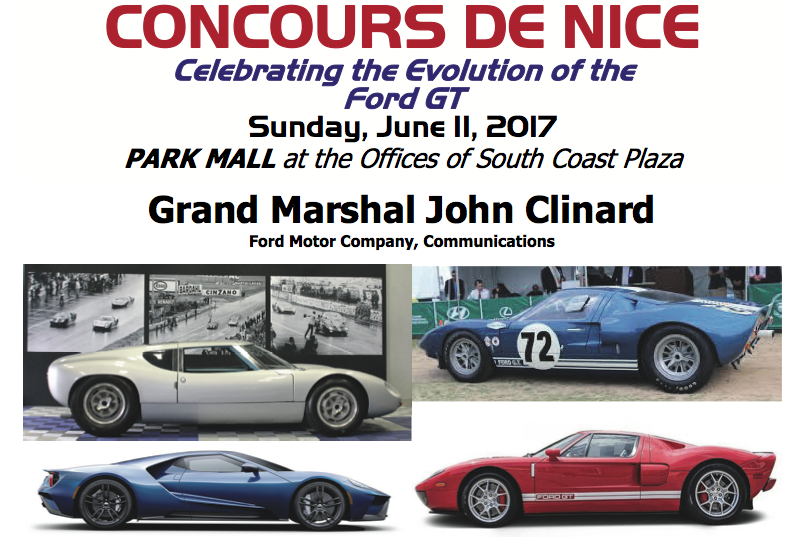 It’s that time of year to get the old steed polished up and ready for our great “Concours de Nice” car show, which will happen on Sunday, June 11, 2017 at the Park Mall at South Coast Plaza in Costa Mesa. This year we are very fortunate to have as our Grand Marshall, John Clinard, who works in Communications for Ford Motor Company! As in previous years, the Concours will again be preceded by our dinner reception in honor of our Grand Marshall at the Superformance/Hillbank Motorsports facility in Irvine on Saturday, June 10th at 6 PM. Please Note: RSVP and payment for these two events is being handled via one of the two options below. 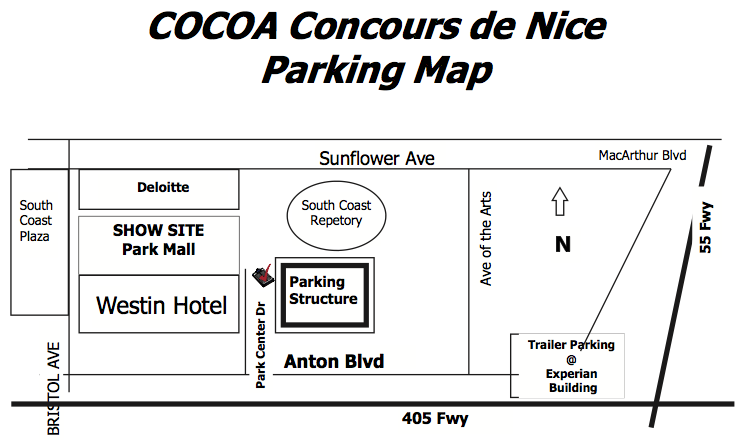 1) Concours Show Participant Plus Dinner Reception on Saturday – RSVP and PAY by mail by completing and mailing the Show and Reception Registration form to Hank Jesch for the Concours and the Dinner Reception and include your check for the $45 Concours + $10 ($55 Total) for the Dinner Reception. The Dinner Reception for participants includes immediate family for the $10 total. If you just plan to attend the car show, then only send a check for $45. 2) Not Participating in Concours: Dinner Reception on Saturday Only – RSVP and PAY by mail by completing and mailing the Reception Registration form to Hank Jesch for the Dinner Reception and include your check for $10 per person. Alternatively, you can also follow the online RSVP link at the bottom of this page and pay $10 per person via PayPal at the time of your RSVP.